If you have recently settled into your new London rental apartment after relocating, you may still be getting to grips with the city’s transport system. Apart from the underground system, know as ‘the Tube’ and the ubiquitous ‘black cabs’ there are a number of cheap ways of getting around the city. Don’t be afraid to get out there and explore the city by different means, you’ll gain perspective as well as experience. A unique way of feeling the heart beat of London and ideal for those looking to get around quickly but avoid the traffic or queues at stations. Riding a bike or motorbike is a very easy way of getting around, but as a cyclist, you should stay in the marked bicycle lanes that are set aside for use. 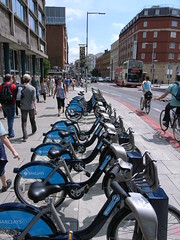 The Barclays Cycle Hire programme is a public bike system for short journeys around the city. Simple to use, you just sign in, choose a bike and you’re off! When you’re finished, drop your bike back at one of over 400 locations. You may see some of the daredevil bike messengers getting around like Evil Kinevil, but remember that this is a busy city and the rules of road must be obeyed. Jeremy Clarkson of Top Gear fame really hates bikers and cyclists, so avoid him if possible; he blows things up! With a motor bike, you’ll have to look for parking at your destination, which is an added cost. The advantage of a bicycle is that you can take them on many forms of public transport across town. Most tourist attractions have bicycle racks for your convenience. Travelling by train is easy, cost efficient and comfortable. There are many stations both underground – the tube, and overland stations that serve London and the rest of England. The railways are well run and for the most part, they run on schedule every day. It can be slightly confusing at first to learn about the different travel zones, but there are handy tourist maps for your convenience. Most of the major attractions are very close to stations so you’ll be able to get around and experience everything that you want to. The major train stations all have their own underground station as well and are interlinked with the tubes to make your travel even easier. In the city center, the busiest station is probably Paddington, this is where the Heathrow Express leaves from and it serves a large area of central as well as the outlying areas of Oxford and into Wales. The most famous station is Kings Cross, but you won’t find the Harry Potter Hogwarts Express on Platform 9 and ¾ here! It runs trains right up to Scotland as well as the north of London. Other major stations include Waterloo, Victoria, (the large coach and bus terminus is here) St. Pancras, Liverpool Street and Euston.